Find Your Filter Enter your Model Number or a Filter Name and click: "Search"
On Sale £ 6.97 - all incl (No hidden extras). ONE: We're well established - we've been trading for over ten years. So we won't be disappearing. Your Money Back Guarantees and Warrantys will be safe. TWO: Join thousands of happy customers - Many of our clients have been buying filters from us for several years. They keep coming back because we offer a friendly, helpful service and great value prices. 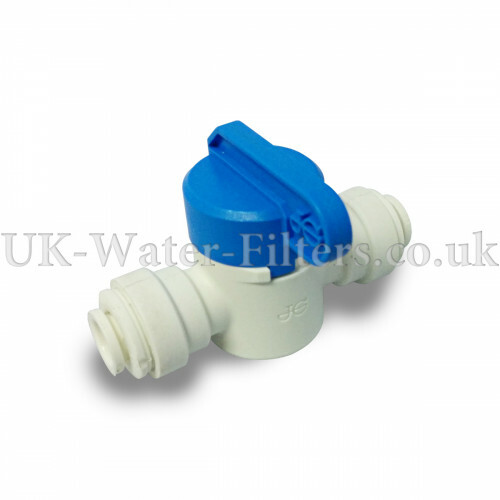 This quick connect in line shut off valve can make changing your filter easier. 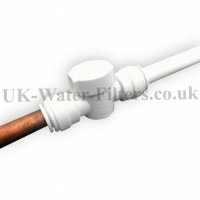 Simply cut the tube and insert this high quality British made unit and you will be able to turn the water supply on / off more easily - particularly if your main water connector is hard to reach. Re-order number code for this part is JGPPSVO40808W. The valve speed-fits 1/4 inch (6.4 mm) tubing. If you don't like what you get send it back for a full no quibble refund. PLUS We'll even pay your return postage ! When changing my Water Filter I found it very awkward to reach the water supply tap to turn it off. I purchased this Inline Shut Off Valve which completely solved my problem. I fitted the Shut Off Valve in the water supply tube to the filter, about 6 inches from the water filter. Now when changing the filter I just have to turn off the valve and change the filter. When the new filter is fitted I just turn the valve back on. Simple. 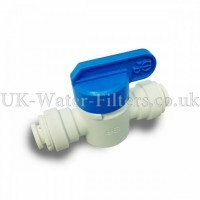 This little tap makes changing the filter so much easier, no spillage - an obvious solution. works well and installs very easily. I received the inline-line shut off valve in great time, sooner than I expected. The valve was exactly as it says; 'quick connect', as it was easy to fit in no time. It also feels like good quality material that will last. Many Thanks. If you don't like what you get, send it back for a full no quibble refund. PLUS We'll even pay your return postage! If, for any reason, you are unsatisfied with your purchase from UK Water Filters you can return it in its original condition within 90 days for a refund. We'll even pay for return postage costs. Read more. Your online resource for Home, Office, Garden and all types of Water Filters and Softeners.